Photographer: "Behind his movements lurked suspicion and anger, a waiting for recognition"
Muhammad Ali by Yousuf Karsh, gelatin silver print, 1970. As people around the world mourn the loss of Muhammad Ali, the Smithsonian’s National Portrait Gallery has added a photograph of the legendary boxer. A portrait of Ali gazing into the camera with his fists at his waist was installed at the museum Monday morning, a museum spokeswoman said. The photograph, taken in 1970 by Yousuf Karsh, can be found on the first floor of the Washington, D.C., museum at 8th and F streets NW. Karsh wrote about the photo in his 2009 book "Regarding Heroes." "The pinstriped suit he wore for our sitting was chosen not for business but to command the respect he rightly felt he deserved," Karsh wrote. "Behind his movements lurked suspicion and anger, a waiting for recognition. "He seemed to be saying, as he wrote later in his compelling autobiography, 'I am America. Only, I'm the part you won't recognize. But get used to me. Black, confident, cocky; my name, not yours; my religion, not yours; my goals, my own -- get used to me! I can make it without your approval! I won't let you beat me!'" A second photo of Ali can be found on the museum's third floor, in the "Champions" exhibit. The museum displays portraits of "men and women who have made significant contributions to the history, development, and culture of the people of the United States," and has over 22,000 items in its collections. 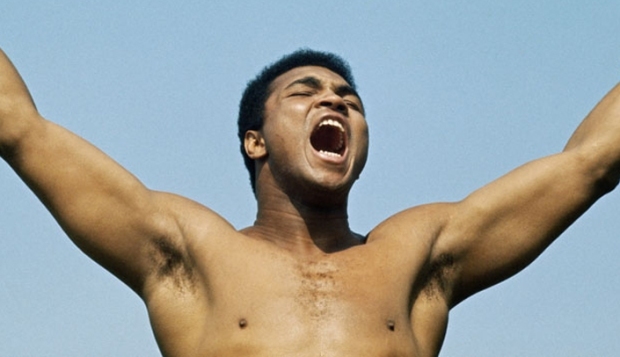 Ali died late Friday in the Phoenix area, and will be memorialized a week later in his hometown of Louisville. Speakers at the public service will include former president Bill Clinton, comedian Billy Crystal and representatives of various religious faiths.